Go behind the scenes of the band’s very metal adventures in augmented reality. Blame iTunes and its instant digital gratification. Blame YouTube and Vevo for making music videos ubiquitous. And blame pirates for hijacking music files and spreading them around the web before artists get to present them in pretty packages. But the fact is, “You can’t just put out an album with songs on it anymore,” says Brann Dailor, drummer for Atlanta-based, Grammy-nominated metal band Mastodon. For the last seven years, the group has written album-length stories about the elements: Leviathan (2004) was their water album, inspired by Herman Melville; Blood Mountain (2006) was the earth record; Crack the Skye (2009) was set in air and space and was loosely based on the story of Rasputin (with references to astral-projection and the death of Dailor’s sister, Skye, at age 14). You get it. These dudes and their music–which bounces between progressive rock and big, gut-rumbling doom metal–are complex. “We just always push ourselves to be weird and try something new and apologize for it later,” Dailor says. But for the first time, they’ve written 14 Black Sabbath-y, Pink Floyd-ian tracks that sound more straight-ahead than anything they’ve ever done. The Hunter, out Tuesday (streaming via YouTube below), is the band’s first non-concept album. Instead, they’ve poured that creative energy into a fully interactive digital experience based on the art of A.J. Fosik (who did the cover of The Hunter and is creating set pieces for the live show), tapping the technical wizardry of digital production house Total Immersion. Augmented reality (AR), the integration of live video and 3-D art in real time (think: the yellow line that marks a first down in televised football), is becoming more and more a part of daily life, owing to mobile visual search apps. It’s also becoming much more sophisticated. Now, the many uses of AR are rapidly evolving, and innovators are taking advantage. Plenty of metal acts of the last 15 years have established their mythos by donning grotesque masks (think: Gwar, Slipknot). And there certainly is precedent for musicians using AR to connect with their fans. Mastodon is putting their masks on fans, using augmented reality triggered by the album art. They’re also the first band of their genre to create this kind of experience, a three-way partnership between the musicians, their label (Warner Bros), and Total Immersion, a software solutions company that has worked on the AR used in Avatar and in experiences for brands such as Coca-Cola and Mattel. Anyone who owns both the album and a webcam and has Internet access can go to the band’s landing page and hold up the album cover to the camera to trigger facial recognition software in the form of an oval-shaped outline in the center of the screen. The user frames his or her face inside that oval, and once the program maps the dimensions of his or her head, it locks in the cover image of The Hunter. Onscreen, the user is now wearing a fully realized 3-D replica of the album artwork–the head of a mythical goat/minotaur hybrid with four mouths full of razor sharp teeth–and this mask moves around with the user, during headbanging or whatever. Album art has always been important to the band. “As fans ourselves, we still like having a piece of vinyl in our hands with cool packaging,” Brann Dailor says. “That’s even more important now that most cover art gets reduced to a 1 x 1 inch thumbprint on someone’s computer screen.” All four members of the band are fans and collectors of visual art. They’ve commissioned a variety of artists including Mars1 and A.J. Fosik to design T-shirts and psychedelic backdrops for their live shows. The album art on the first four albums was mostly handled by Paul Romano, who supplied the band’s signature font and baroque imagery of those releases. For the band’s first non-concept album, Mastodon opted to work with A.J. Fosik, whose work they’d been following for years. “The band and I talked, they gave me a rough idea of the intention and themes of the album and then they let me loose,” Fosik says. The artist’s medium is wood and his specialty is carving heads of mythological creatures, with some kind of fracturing element (e.g. the Hunter’s multiple rows of teeth.) He then paints the finished sculpture in phosphorescent colors. 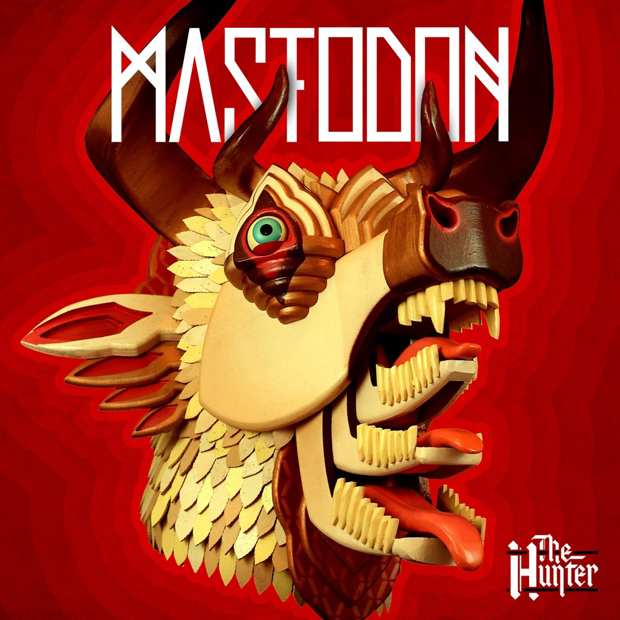 The band wanted something that nobody had seen before for the cover of their newest album, and they picked out a rough version of a minotaur head that Fosik went on to develop into the Hunter. “People use AR to try on clothes and glasses from home,” says Rick Deweese, West Coast Sales Director for Total Immersion. “Now they can use it to interact with their favorite bands.” Deweese introduced the concept of AR when the label contacted the company. All parties agreed it was a natural fit for the band’s collective identity and its particular fan base–an advanced level of metalheads who more than likely own a 20-sided die. Soon they began collaborating on a vision for the project. Total Immersion designed the AR for The Hunter while the band was on tour, but the group’s members were able to weigh in from the road. “We need to be excited about what we’re doing,” Dailor says. “We have to reinvent ourselves or we risk getting boring.” By providing fans a chance to literally get inside their head on its latest release, Mastodon has forged some seriously new metal.